Are you looking for high quality blower, vacuum or mulcher then all these three things you can get in Black and Decker BV6600. It’s high performance three in one tool. This tool let you maintain beautiful yard anytime with great ease even in autumn months. Black & Decker is one of the most trusted company of the world which was founded around 100 year back. Anyone who is familiar with power equipment or garden must be familiar with this brand. 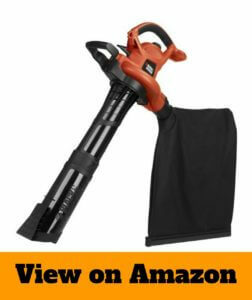 The Black & Decker 3-in-1 BV6600 is also a great product as we expect by this brand and does the job as good as advertised. Thus this is high powerful machine (250 mph) bowler that not only capable of gathering fallen leaves and debris but also vacuum it by great ease. 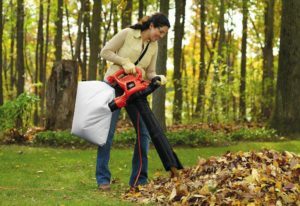 It collect debris and fallen leaves after shred it into pieces/dust in attached reusable bag which can be emptied after it is full. It doesn’t matter you have few trees or dozen trees this does work without any interruption. This BV6600 comes compact design with 2 handle suitable for both single handed and double handed use. It can he hung to strap that comes with product can be carried around long hours. It’s weight is 8.1 pound which is lightweight than other machines in market. Black Decker BV6600 features 12 amp motor that’s capable to generating an air blow with speed of 140-250mph with variable speed selection. It’s vacuum is very powerful that can clear small twigs and pine as well. Usually blower and mulcher make noise but this Black Decker BV6600 is 50% quieter than other models compared to other machines. Before using it make sure leaves are totally dry. Some user complain that metal fan for mulching is very small as a result leaves clog up more than they should that make it little slower than you normal. As i told it comes with detachable shoulder strap but still people say it’s heavy. If you will be using long period you could get little heavy and it force you to take some breaks. Why you should buy Black & Decker BV6600? This is three in one very useful tool and there is great advantage of having this tool. No one likes to pick up leaves by hand and collect them in disposal, it takes a lot time and energy. But this Black+Decker BV600 three in one tool solve all the problem and do work very fast and effectively. This tool is great to clean lawn, garden or outside home/school/office. It’s very convenient to use. This is a great useful tool, it pick up leaves, collect debries and do job very effectively. Currently it’s in stock on Amazon which you can purchase less than *$100. You’ll like this tool it for sure, Indeed great value for money and useful tool.